As I’ve mentioned in an earlier post, I was far from thrilled with the November 1979 trade that sent Chris Chambliss to Toronto and brought Rick Cerone to New York to replace Thurman Munson as Yankee starting catcher. Besides being a huge Chambliss fan I was hoping Steinbrenner’s front office would go after Ted Simmons, the Cardinals switch-hitting receiver, to succeed Munson. Cerone’s performance in 1980 helped me get over that disappointment pretty quickly. Even though his lifetime average at the time of the trade was just .229, Cerone hit .277 during his first year in pinstripes, caught 147 games, drove in 85 runs and led the league by throwing out 52% of the runners attempting to steal against him. He was a huge reason why that 1980 Yankee team won 103 regular season games and the AL East Division title. He was also one of the few Yankees who played well in the three game loss to the Royals in that season’s playoffs. 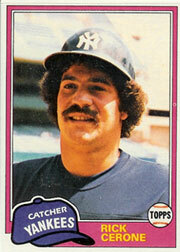 Like many players on many teams, Cerone’s Yankee fortunes began to turn sour during the strike shortened 1981 season. He hit just .244 and his run production per game was less than half of what it had been a season earlier. He gave up more steals as well and for the balance of his eighteen-year big league career, he would never again put up anything even close to the numbers he posted during that 1980 season. Cerone’s most widely publicized moment in pinstripes happened during the weirdly configured 1981 post-strike postseason, after the Yankees lost Game Four to fall into a two-two tie with the Brewers. 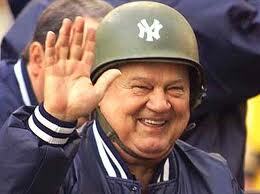 George Steinbrenner came into the Yankee clubhouse after the game and started berating his players. Cerone screamed right back at the Boss, telling the owner his rants were of no value whatsoever to the team’s performance.Cerone was also not a fan of Yankee skipper Billy Martin and the feeling was definitely mutual. The Yankees let him go a first time in a 1984 postseason trade with the Braves, for pitcher Brian Fisher. They signed him back as a free agent during the 1987 spring straining season. He was the starting catcher for manager Lou Piniella’s team that year and then caught a lot of games for the Red Sox in 1988 and ’89. New York picked him up a third time, in 1990 and Cerone had the first and only .300 batting average of his career that year, even though his season was comprised of just 149 plate appearances. After he retired as a player, Cerone formed and owned the Newark Bears Minor League team in his New Jersey hometown. He sold the Bears in 2003. Cerone shares his birthday with the AL Rookie of the Year Award winner in 1951 and this one-time Yankee pitcher. Today’s Pinstripe Birthday Celebrant was the back up catcher on one of the greatest teams in MLB history, the 1927 Yankees. Johnny Grabowski had broke into the big leagues with the White Sox in 1924 and spent three seasons in the Windy City as a backup receiver to Hall of Fame catcher Ray Schalk. In January of 1927, Chicago traded him and a second baseman named Ray Morehart to the Yankees for second baseman, Aaron Ward. Ward had lost his starting position in New York to a rookie phee-nom named Tony Lazzeri in 1926, making him expendable. Grabowski was the key to the deal for New York. He had developed a reputation with the White Sox as a good defensive catcher and the Yankees wanted him to backup their regular receiver, Pat Collins. Grabowski filled that spot admirably in 1927, getting 56 starts behind the plate that season and averaging a healthy .277. With Ruth and Gehrig providing the punch, that Yankee team set a record for wins in a 154 game season with 110 and then swept the Pirates in four games in the 1927 World Series. The juggernaut continued the following year as the Yankees won their second straight pennant and pulled off their second straight four-game World Series sweep, this time versus the Cardinals. Grabowski actually started more games behind the plate than any other New York catcher during the 1928 regular season, but his batting average plummeted to just .238 and that offensive ineptitude got him left off that year’s World Series roster. 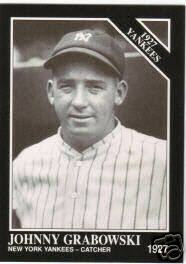 When Grabowski’s offensive troubles continued during the first half of the 1929 season, the Yankees released him. Grabowski eventually returned to the minors and then got a second shot at the big leagues with Detroit in 1931. When he failed to stick there, he turned to umpiring. He was advancing up the ladder as a minor league man in blue when he was tragically killed attempting to fight a fire in his Guilderland, NY home, in May of 1946. Grabowski was only 46 years old at the time of his death. 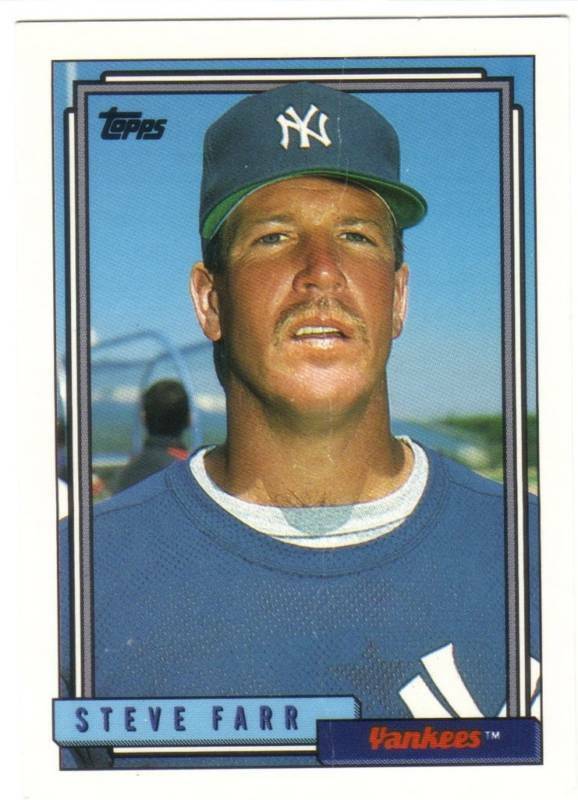 He shares his January 7th birthday with this former Yankee second baseman and this one-time MVP. “Popeye’s” original connection to New York City baseball was over half a century ago when he was being groomed to replace the great Pee Wee Reese as the Brooklyn Dodger starting shortstop. That never happened. A terrible beaning Zimmer suffered as a minor leaguer in the Dodger organization left him unconscious for three weeks and resulted in a metal plate being inserted in his head. The incident left him a different player. He still had the shotgun arm his teammates raved about but he would never become a productive big league hitter. He played three part-time seasons in Brooklyn and two more in LA before he was dealt to the Cubs after the 1959 season. He got quite a few at bats in Chicago but never got his batting average above the .250’s and the Mets drafted him in the NL expansion draft of 1961. Zimmer lasted only 14 games with the Amazins and retired as a player in 1965. He then began the most successful part of his Major League baseball career. He got his first big league managerial assignment with the Padres, replacing Preston Gomez twenty games into the 1972 season. The Padres lost 190 games during Zim’s almost two season tenure, which lost him that job. During the 1976 season, he was named the Red Sox Manager, replacing Darryl Johnson. The four and a half seasons he spent calling the on-the-field shots in Fenway were the most successful of his career. His Boston teams finished 411-304 but couldn’t get past the Yankees to make the playoffs. Zimmer then got managing jobs for the Rangers and the Cubs. In 1996, he became the fiery bench coach for Joe Torre’s four-time World Champion Yankees. His most famous moment in pinstripes came when he went after then Red Sox ace, Pedro Martinez in the third game of the 2003 American League championship series, after the teams exchanged brush-back pitches. Zim left the Yankees, livid at George Steinbrenner’s treatment of Yankee manager Joe Torre and his fellow Yankee coaches. I enjoyed his colorful behavior both on and off the field. Zim shares his birthday with this one-time Yankee DH and the first-ever Yankee super scout.